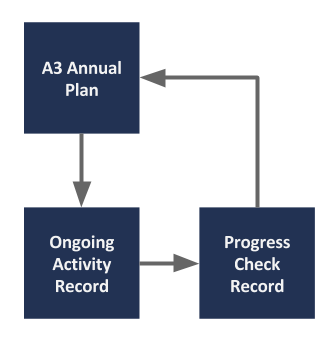 There are three key documents used to plan, track and assess CPD activity – the A3 Annual Plan, the Activity Record and the Progress Check Record (all are Google Docs files). 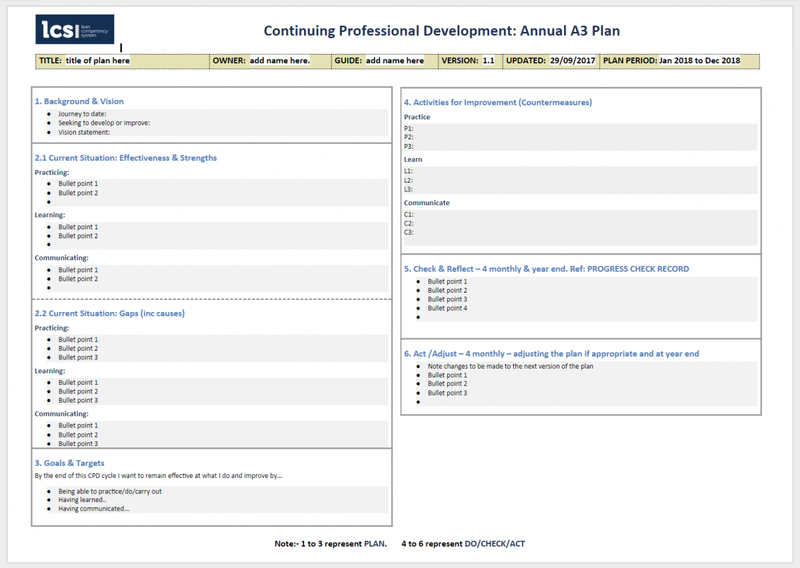 The A3 maps out your CPD plan for the year, with your ongoing CPD activities being recorded in the Activity Record, while the Progress Check Record captures your periodic and annual reviews – which can feed into the next iteration of your A3 plan. Your key CPD documents are stored in your own cloud based storage area in Google Drive, along with other supporting documents. Only you (and LCS CPD Advisers) will have access to your folders. To update your CPD activities you simply access your activity record document, add an entry, date it and close it. The plan is designed to fit on one side of A3 paper, using bullet points and succinctly written. If the plan strays on to two pages, you will be requested to edit it so it fits on one page! Guidance notes are provided in the CPD Handbook and sample plans are also available. Updating your activity record should take place frequently, preferably as soon as possible after the CPD activity has taken place. This ensures your recollection of the activity is fresh and accurate. Once you have accessed your CPD Activity Record in your personal CPD folder on Google Drive, you add specific update information in one or more of the three categories, revise the Date of Update and close. You can also add planned activities to the record, as you are likely to have several scheduled events like a course, conference, book to read, key presentation or project that you know are likely to have a positive development impact. You can then update the entry shortly after the activity has taken place with take-outs and future actions. The Google Docs Activity Record document (above) has one line for each development activity. The description of the activity is added in column 4. Again, succinctness is the key for completion and the use of bullet points is acceptable; do not be compelled to add copious details for activities every time one is added. For example, if there is just one action, take-out or reflection arising out of an activity, then that is fine. Note that each activity should link to an element in your annual plan – see column 5. You should aim to review your plan at least twice during the annual cycle and then at the year end. The four monthly reviews can be a light touch check, which can take account of unanticipated changes in priorities that sometimes arise due to the unexpected twists and turns of working life that impact on your role and priorities. If there are substantive changes as a result of a review, then the A3 plan can be updated and a new version created. The annual review should take place on the annual anniversary of the date you started your CPD process. 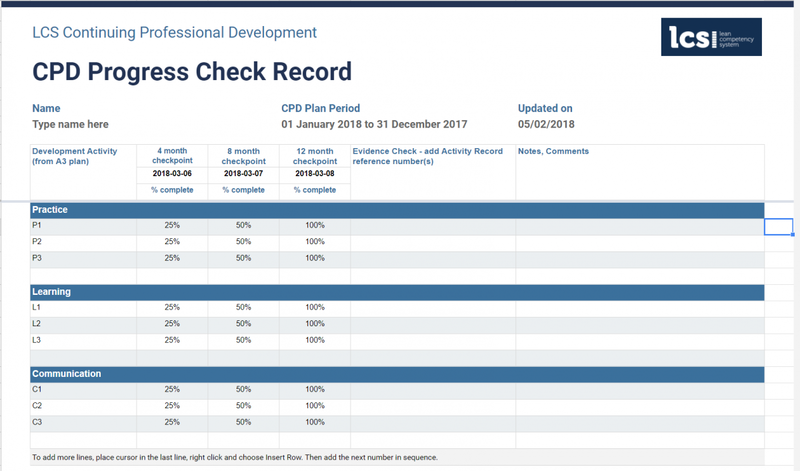 The review process comprises of a self-assessment of your progress in achieving the activity targets set in your annual CPD plan and you should use the Progress Check Record document for this purpose. The progress check record refers to the activity targets in your annual plan and you make an assessment your success in achieving them by assigning a percentage completion number. You can list the activity reference numbers that relate to them as an evidence check and you may add notes or comments where appropriate. 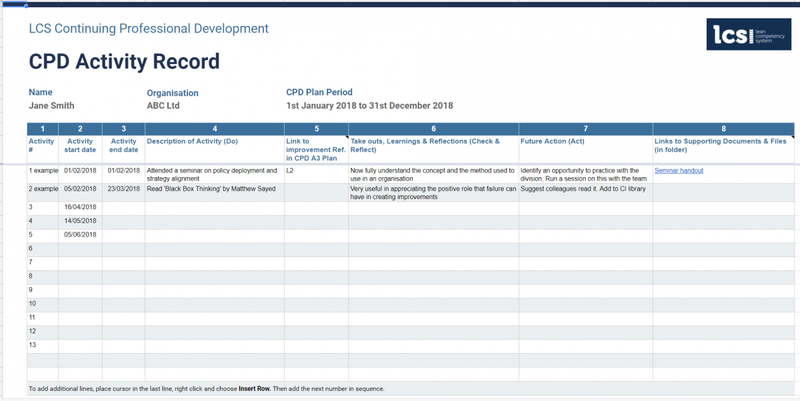 The completed year end form feeds into the next version of your annual CPD plan. LCS assessors will check your review to ensure it is balanced and appropriate, meeting acceptable levels of development, with all components active and up to date. Once verified, your record will be updated and a new certificate issued. The LCS CPD process does not set quantified targets for CPD activities, for example, a certain number of learning hours, or conferences, or projects etc. Rather, it focuses on the degree of achievement of a robust CPD plan that demonstrates solid progress and continual learning, personal development and improved practical ability. As a Practitioner Member you can join or initiate discussion forum topics, collaborate with like-minded practitioners, connect and network in private groups. You can access teaching guides and material to enhance your training system and design, contribute articles on current issues and debates, or organise and communicate special events for members. You can also promote your lean credentials to the community, ask members questions to help solve problems, participate in and share in the results of LCS sponsored research and keep up to date with developments via the LCS Newsletter.